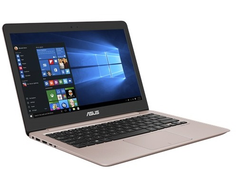 Asus hat started updating the Zenbook UX310 notebooks with Kaby Lake processors. Asus has started updating their Zenbook UX310 series with Kaby Lake processors. US pricing and availability has not been announced yet, but UX310UA and UX310UQ models have started appearing in Europe. The Zenbook UX310 series ist only about six months old, but Asus has already started updating the notebooks with Kaby Lake processors. The rest of the specifications remain the same to previous models with Skylake processors. There are two models, the UX310UA with Intel graphics and the UX310UQ with Nvidia GPU. Both are available with various processor options, up to 16 GB of RAM and up to 512 GB of SSD storage in addition to a 1 TB internal hard disc. The 13.3 inch notebook weighs in around 1.5 kg and comes with a Full-HD TN-display, that unfortunately did not perform so well in our test of the model UX310UQ-GL011T with Nvidia graphics and Skylake processor. The notebook did excel in performance and battery life however, and scored a good rating of 84 percent overall. Pricing for the updated models with Kaby Lake processors for the USA have not been announced yet but the new models are already listed as available on European price comparison website Geizhals.